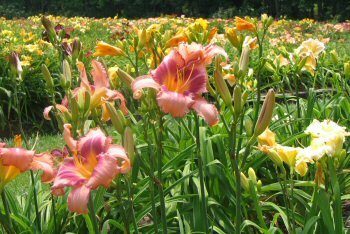 This American Hemerocallis Society display garden features a collection of approximately 800 cultivars of daylilies in a spectacular array of colors, sizes, and flower forms. Interpretive labels identify each plant cultivar and its hybridizer. The garden continues to evolve as newer cultivars are added each year. A group of spider daylilies grow in one of the back beds and the miniature bed has additional daylilies. The bloom season usually begins in late May and peaks in mid-June, with rebloom on many varieties until frost. As daylilies from the Garden outgrow their space, divisions are potted and offered to members and the public for sale each September. The Daylily Garden is maintained by an enthusiastic group of volunteers who always welcome extra hands. To volunteer call Rosa Belle VanValkenburg 256-534-8583.